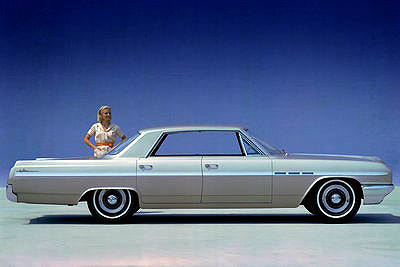 My dad's 1964 Buick LeSabre sat in the garage gathering dust for at least three years after he died. To a child's eyes it was a big car, but I know for certain that it was a small garage, which required you to edge carefully around it as soon as you walked through the door, collecting smudges of dirt on your clothes as you tried to retrieve a garden rake or whatever else managed to share the space with my father's car. It was brown - that dull, coppery earth tone that was the era's car colour signifier of solid, stable and mature. He bought it the year I was born, but since his health deteriorated every year until his final heart attack, I doubt he got to drive it as much as he might have liked. You don't see a lot of LeSabres around these days, but I'd love to find one again, just to get a sense of how big it really was, and to see if it would trigger some palpable sense memory of my father, a man I truly loved and who I knew for such a short time. It would be a bonus if it was brown. I had that memory vividly revived years later in Havana, driving around the city with musician Guillermo Barreto in his beautifully preserved '56 Chevy, which actually smelled like Uncle John's car, the tobacco smoke curing the leather upholstery in the humid Cuban air just as it had in my uncle/grandfather's car many miles north in the heart of Canada's rust belt. It's a stretch to imagine that I might have learned to drive in my dad's LeSabre. Even if he had lived, I doubt that he'd have kept the same car for more than a decade and a half, if Canadian winters had let it survive that long. He'd have hit retirement age by the time I'd have gotten my learner's permit, and I imagine him trading in the LeSabre for something new as a treat. 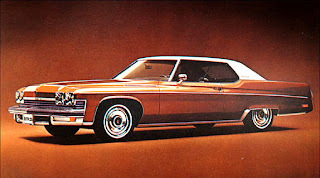 Given the brand loyalty peculiar to Ontarian men of my father's generation, it would probably have been another Buick. 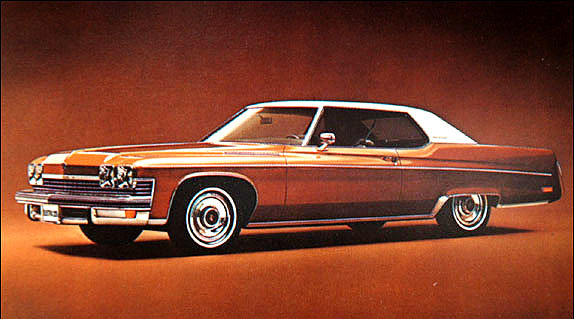 They were still making the LeSabre in 1974, but I imagine my father going for a bit of a change, something just the slimmest fraction sportier - a Riviera, perhaps, or an Electra. A coupe. In brown. It would have been this car - along with my brother-in-law's Audi Fox, maybe - where I would have learned to drive. I doubt if Dad would have gone for the high performance Stage 1 dual exhaust engine, so I would have had to tentatively take to the road piloting a 5,000 lb. sled with a 455 V8 with 3-speed automatic transmission and Max Trac traction control, if Dad had gone for that option. It would have been a beast of a car to learn in; an old man's car, which I probably would have driven like an old man, on the rare occasions that he might have let me take it out. But that's another world. He never bought that car, so I never learned to drive in it, and the LeSabre was long gone by the time I was sixteen, our garage empty and our driveway untenanted by any car. We sold it to George Parker down the street, who only had the LeSabre for a few years before he sold that on for a new car, make and model unremembered by me, though I do know that it was the car where his son, my friend Shawn, found him in, dead of a heart attack while waiting for him after school. Dads didn't last long where I grew up. And so I miss that LeSabre, though I can't blame its absence - or the lack of any car at all - for my unwillingness to learn to drive back at the dawn of the '80s. For that I blame a golf cart. But that's another story. Shawn Parker has a role in that one, too.